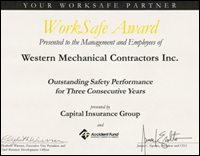 Western Mechanical is committed to the health and welfare of our employees. The goal of our Safety Program is zero work place injuries. The message taught at every level from management to labor is: Safe work habits are the responsibility assumed by everyone on the job! The framework of our Safety Policy includes employee training, safety inspections, incident investigations, first aid training, safety bulletins, weekly job site tool box talks, and a hazardous communications program. New hire training, as outlined in the manual, stresses safety education as part of an employee's orientation program. Field employees are required to attend weekly safety toolbox talks and are encouraged to observe all company safety rules and policies. Superintendents and foremen are responsible to ensure job sites are clean and organized according to all company safety policies. 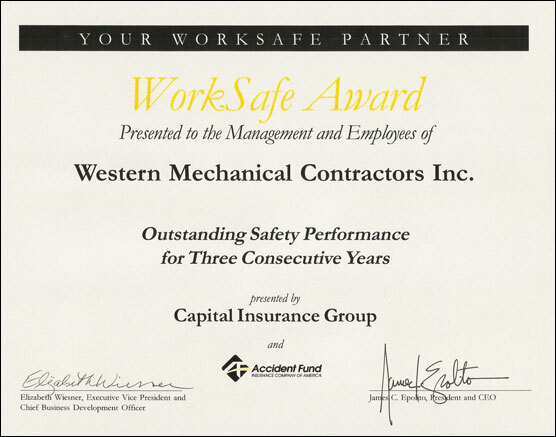 Safety incentives are an important part of Western Mechanical’s safety culture. Weekly Safety Keno, Quarterly Raffles and an Annual Raffle reward employees for zero injuries and positive safety inspections. The games are a constant reminder of the importance of jobsite safety and they stimulate a special camaraderie among our employees.